Posted on July 21, 2016 by thelostlighthouse	in Comics, Literature and tagged behemoth, biblical, comics, comics reviews, Frank Martin, golem, horror, independent comics, indie comics, indie comics review, Insane Comics, Literature, monsters, The Lost Lighthouse, TLL, War. This week I’m reviewing Modern Testament Volume 2 – a collection of three short stories published by Insane Comics that was sent to me last month by the author and creator Frank Martin, with each tale illustrated by a different artist or art team. Each takes a biblical being struggling to fit in and adjust to the modern world, as they try to find meaning or remain relevant. The first tale is ‘Schoolyard Monster’, illustrated by Adrian Crasmaru. Joey has a common schoolyard problem – bullies. Specifically another kid named Rudy, who is seemingly the ringleader for all the other children. But after being pushed down in the mud again after school, the mud around Joey starts to coalesce into a silent and stoic golem. And the next time Rudy hassles Joey, he is in for an unwelcome surprise. Schoolyard Monster is an engaging tale with a framing device that plays up the ‘careful what you wish for’ story beat. The art was scratchy and rough (in a good way! 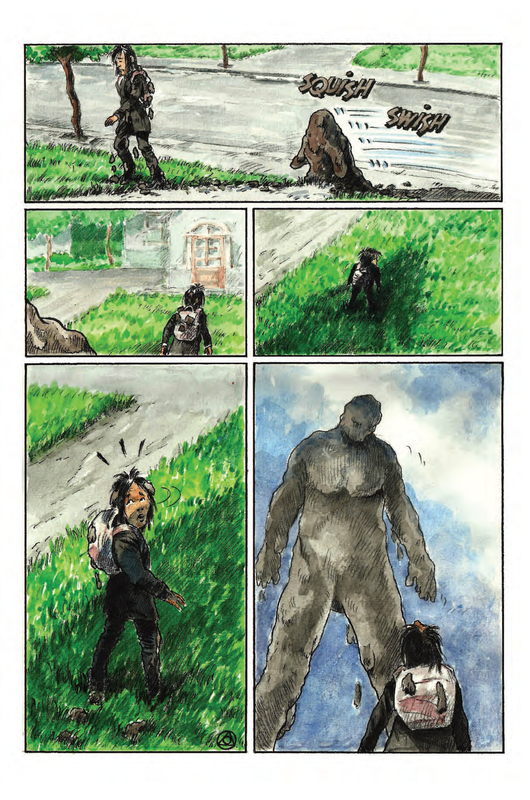 ), with detailed and heavily expressive facial work and an almost watercolour palette, that gave an overall feel that reminded me of Jeff Lemire’s work. 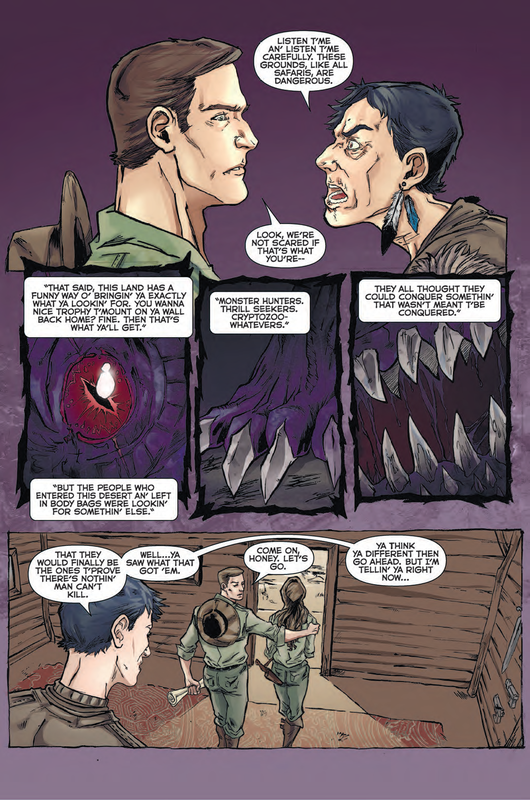 The Great Hunt’ was drawn by Igor Chakal and coloured by Stanislav Leanov, and tells the story of two big game hunters heading out on safari to bring down a beast of unimaginable power – a behemoth. Despite warnings from the reserve warden, the pair head out to seek the monster they have heard so many rumours about. And obviously that all works out fine for them. This second story was probably my favourite of the three. It was simple, it had strong and natural dialogue, and I do enjoy a tale of idiotic hubris. The art was especially good too, with nice renderings of a savanna environment and a really oppressive and claustrophobic edge as darkness falls. The behemoth itself was terrifying to behold, and the ensuing action was fantastically brutal. Finally ‘What is He Good For? (Absolutely Nothing)’, drawn by Noreus Teves and coloured by Laura Ruggeri, was perhaps the most light-hearted yet chilling story. An injured war veteran relaxes aboard a cruise ship, his family somewhere else on deck, and he is approached by a mysterious stranger. This man hands over his business card ‘War – Horseman of the Apocalypse’, and shows he isn’t joking by showing visions of the savagery he has had a hand in over the years. Having been content to sit back and let humanity do most of his work for him, he has now come up with a plan to speed up his end of the apocalypse. And it involves the cruise ship. This final tale was entertainingly bleak, with an arrogance behind War that was a lot of fun to read. The art was bright and laid back and light on action, with the vibrant ‘vision’ page to the right accounting for most in the story. instead focusing more on body language and facial expressions with some fairly heavy line work that worked well. Modern Testament Volume 2 is a fun, quick read with strong dialogue and three intriguing tales that show a lot of potential in the writer. 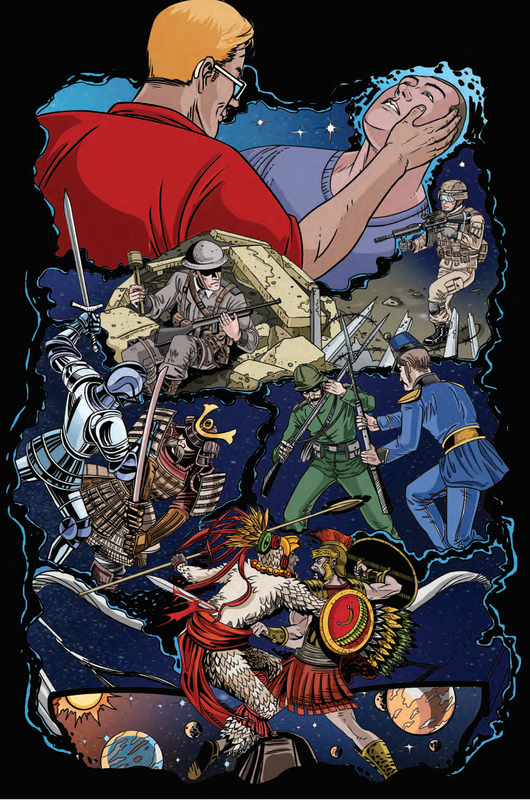 The art in each is distinct and suits the story, as well as being great to look at. You can check out Martin’s Facebook page here, or order Modern Testament direct from Insane Comics either physically or digitally.